If you missed the weekly meeting of the Civil Air Patrols 391st Composite Squadron on Monday 14 November, you missed a great meeting. After the usual announcements by Lt Col Bobby Sides who was subbing for Squadron Commander Captain Ian Jaeger, Captain Al Garrett introduced Bill Signs. Mr Signs presented a very interesting account of his reenactment of Charles A. Lindbergh’s record-breaking flight across the Atlantic Ocean, enroute to Paris, France. Lindbergh’s actual flight time across the Atlantic, was some 33.5hours. Bill Signs time was considerably less, just 23 hours. Both flights began in San Diego California, the place where Mr. Lindbergh first picked up the Ryan Monoplane he named “The Spirit of Saint Louis”. Next stop Saint Louis, Missouri. Roosevelt Field in Long Island (now closed) was the site of the original record setting flight by Lindbergh, in May of 1927. The site is now a shopping center. Bill Signs took off from Republic Field, Long Island, New York. Signs carried six ham sandwiches and a bottle of water, the same as Lindbergh. Weather conditions, and the time of day of “ lift off” were the same as Lindbergh’s. On arrival in Paris, Lindberg circled the Eiffel tower twice before landing at Le Bourget airport. With the help of two air traffic controllers whom he had met earlier, Mr. Signs accomplished the same maneuver, circling twice around the famed land mark before landing at LeBourget. Unlike Mr. Lindbergh, Bill Signs chose to fly his plane back to America. Lindbergh had the “Spirit of St. Louis” placed in a special crate and loaded aboard a U. S. bound destroyer. Today, the crate still exists; it is part of a visitor center at a small airport in upstate Maine. Signs’s route back to the U.S. followed the same route used by the U.S. Army Air Corp to deliver planes to Europe during World War II. The route led from England to Scotland, Iceland, Greenland, Canada and the U.S. Several years earlier, Signs had participated in the“70th Anniversary of the Flight from Barrow, Alaska to Spitsbergen, Norway. Spitsbergen is the largest of the islands of the Archipelago islands located off the coast of Norway just below the Arctic Circle. Mr. Signs displayed antique flight equipment and artifacts he had accumulated in his years of flying throughout the world and to the North and South Poles. 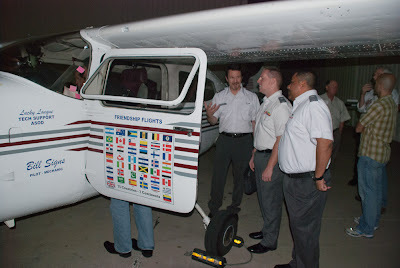 Mr. Signs was also kind enough to bring the 1974 Cessna 210L, In which he crossed he Atlantic, to the Portico of Dallas Business Jet for our inspection. At the end of the meeting, some Cadet and Senior members were given souvenir baseball caps commemorating the “Friendship Flight 98” and the 70th Anniversary of the Barrow to Spitsberg flight of Mr. Carl Ben Eiselson . At the conclusion of the program, 2nd Lt Winston Cutshall presented Mr. Signs with a certificate of appreciation from the Squadron. Our thanks to Senior Member Captain Al Garrett for arranging for the appearance of the guest speaker.